It feels like I literally blinked and we're already nearly in June, which shows i've been mega busy and a lot has been going on this month but this month has definitely been the calm before the storm. Well here we are again, another end of the month and another monthly favourites post, sharing with you a few products i've been loving this month. I initially found this favourites quite hard to pull together, as I haven't been trying that many new products this month, and I didn't want to just post about products i've already spoken a lot about. Having said that I wanted to talk about a few select products that have really surprised me this month and I wanted to give a bit of a first impressions on them. If you caught one of my recent posts, then you will have seen that I recently had the opportunity to try out the L'oreal Smartbond Treatment as my local Regis Salon (of which you read my post here) and they very kindly sent me the L'oreal Smartbond 3 Conditioner* (£12.99) which is step three to the treatment of which you use at home in between salon treatments. I've used this a few times now, and although my hair is still amazingly soft after having the treatment i've noticed that this has continued to make my hair feel like it's been treated at a salon. Although it is early days and i've only had one treatment, it's definitely something I would highly recommend to anyone, who like me has quite damaged hair. A recent purchase of mine that I never thought i'd make was for the Missguided Babe Power Perfume (£28). A friend of mine recently wore this and I couldn't get over how amazing it smelt so of course I jumped straight on their website to order it and of course I made sure to use their 30% student discount that they had on at the time. For me it's the perfect summer scent and has a lovely mix of fruity and floral notes, which is right up my street when it comes to fragrance. If you're on the hunt for a new fragrance that isn't going to break the bank, then i'd definitely recommend trying this out. Lastly for this months favourites is the Nadia HNC Gel Nail Starter Kit* ($99.99) which is the perfect at home gel nail kit for anyone wanting to start trying gel nails at home but without the toxic chemicals that some kits contain. 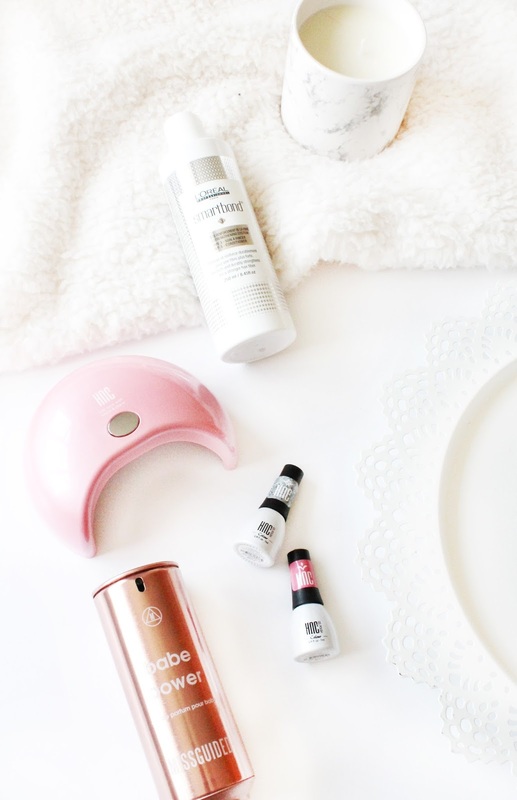 Although I did only receive this a couple of weeks ago, I wanted to share my first impressions on this kit as it one of the best at home gel nails kits that I have tried. The kit comes in a small cary case containing everything you will need, including base & top coat, five polish shades, cuticle oil, LED lamp and a few different tools to help you achieve some cute nail art looks. The gel polish itself is of an amazing quality and the shades are so beautiful that i've found it hard to choose which shade to go for! I will be sharing a couple more posts on this kit in the coming weeks, with a few nails looks and also a more in depth review, so if you want to find out more on this kit then stayed tuned for that. So those a few products that i've enjoyed over the past few weeks, of which I will be sharing more about over the next few months once i've really gotten to grips with all of them to give a more full review!